In the week that Barack Obama was sworn in for a second term as US president, Fairplanet asked five young Africans about their hopes for their country's relationship with the US over the coming four years. As Barack Obama is sworn in for a second term as US president, Fairplanet asked five young Africans about the ways in which US relations with their respective countries might better develop over the coming four years. HIV/AIDS, famine, Kony, corruption, poverty... after years of negative images on our television screens it would be easy to write off Africa as the world's loser continent, perpetually beyond the remit of hope. But Africa is moving forward, and bright, young, outward looking Africans are increasingly positioning themselves to re-take a creative role in the future development of their home nations. 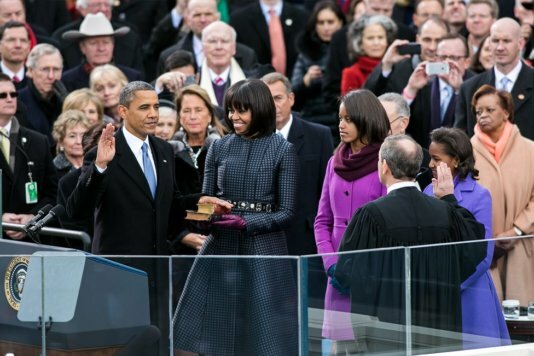 As a half-Kenyan president is sworn into office for a second term, what might African's hope for from Obama 2.0. We need to move away from the image of Africa as a young snotty boy with flies on his face. It can stand on its own feet! "I would rather ask, what can Africa do for Obama? Let’s face it, America with its economic meltdown needs Africa and its natural resources, especially since six of the world's ten fastest-growing economies are African. We need to move away from the image of Africa as a young snotty boy with flies on his face. Africa has its problems, sure, but it can stand on its own feet and without the exploitation and unethical trading. So dear Mr President instead of supporting ‘democracy from Asia to Africa’ just focus on the inequalities of your own United States of America." Hamdi Khalif, 23, is a British-Somali and recent biochemistry graduate from University College London in the UK. I would ask for support to be given to strategies and organisations that provide psycho-social intervention to traumatised children. "For me working with Street Children in South Africa I would want the Obama Administration to invest in the rights of Africa's children living in the street. I would ask for support to be given to strategies and organisations that provide psycho-social intervention to traumatised children. I would ask for an administration which will lobby for their access to healthcare and diversified education". Obama has some stepping up to do. The best way for him to make a fresh start towards aiding Africa is to emulate his formers. The rest is up to us. "When compared to his predecessors and their contributions to Africa, Obama has some stepping up to do. There was the African Growth and Opportunity Act by Clinton which greatly reduced trading barriers between our continent and the United States; and with George Bush there was the Millennium Challenge Corporation, the President’s Malaria Initiative, and the President’s Emergency Plan for AIDS Relief and all without doubt, actively saved and positively impacted lives. Obama's efforts to contribute towards Africa's progress in my opinion, have fallen short. And the best way for him to make a fresh start towards aiding Africa is to emulate his formers. The rest is up to us." If I was to speak from a technology perspective, I would like the Obama administration to try and focus on strengthening the innovation culture on the continent, starting with strongly highlighting the need to establish a proper, functioning Intellectual Property system sensitive to the continent’s needs (copy/paste will obviously not work). "A proper IP system establishes a legal basis for a population to be creative. It provides both a cultural and financial incentive for people to innovate and I believe that it is innovation (not any amount of aid) that will really change things for the better on the continent. In the long run the socio-economic benefits of fixing the IP system in Africa (all over, not just in the 5 tech hub countries) would be massive. A single innovator secured by good IP law could impact an entire region’s economy with their creations. Now imagine a continent with millions of them. It is still silent for now but the fact is, countries in Africa are competing innovation-wise and those who are being left behind by the front pack won’t want to stay behind. After a while they will get on board when they see the effect proper IP has on other economies they compete with. The administration could do this in different ways but of course, it should be more of a publicly expressed desire for the administration relatively early on in the second term as this would draw a significant amount of attention to the issue and highlight its importance, while giving them a realistic timeline to deal with the matter. The expressed desire should also come with an offer to help any country on the continent interested in pursuing this with any assistance they need in terms of data and legal expertise. This is far better than financial aid because what it will do is strengthen the innovation and entrepreneurial eco-systems in the long run, both of which are pillars upon which the progress of Africa is hinged. This is teaching Africa how to fish better as opposed to giving them an extra fish. Innovation and entrepreneurship are the engines of growth that will drive African economies into double digit growth and an improved standard of living for its 1 billion plus residents. The US putting the development of African IP law on a global stage agenda would go a long way in mobilising other countries & organizations to join in the revolution and set Africa up for prosperity in the long term." Kageni Wilson is a Kenyan innovator, writer and tech entrepreneur. He is the Founder & CEO of personal cloud computing provider, ionacloud. Please stop the support of dictators, by any means. "I am a fan of, and admire President Obama, and what I would ask of him would be to put the resources of the people of African Countries in the hands of the people, and not those of corrupt or abusive governments - especially like the dictators in Sudan. Any support given to theses government goes to fund armies and weapons that the dictators use to to fight and suppress their own people as in Darfour, Blue Nile and Nuba mountains, and therefore perpetuate their own power. Please stop to support the dictators, by any means." Abdelaziz Baraka Sakin is a best selling author from Sudan, whose books tell the story of political oppression in his home country.